The kitchen had a two burner electric range, an over-sized toaster oven that doubled as a regular and convection oven and a decent amount of counter space. Perfectly adequate for the average vacationer who will probably spend more nights eating out than in. But I love to cook. I actually enjoy cooking most on vacation because it gives me a chance to explore the local scene where I’m visiting. I eventually got over the lack of a real stove (do you know how difficult it can be to only use two burners?). It was when I dove deeper into my cooking tools that I was ready to pack my bags and head home. NO CHEF’S KNIFE. There was a large serrated bread knife, a few pairing knives and steak knives. 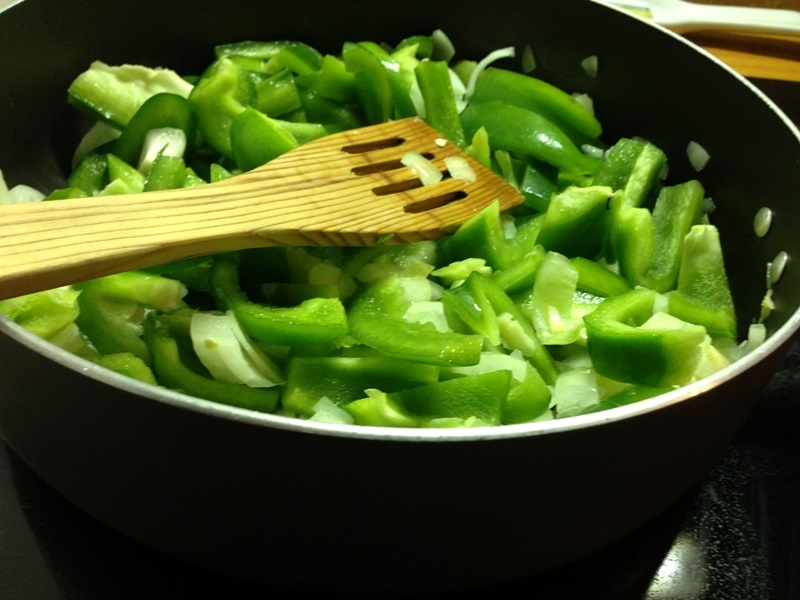 I was forced to cook every meal–chop peppers and onions, slice corn off the cob, mince garlic and scapes with an ordinary steak knife. A fairly dull one too, I might add. But I am resilient! Remember when I made whipped cream with a hand crank beater? So while I continued my cooking, please accept my apologies for the photographs. They might appear a bit more gnawed and tortured than usual. The one saving grace of the quaint kitchen was discovering an old school crockpot buried among the pots and pans. If you’ve stopped by to read even once, you know my love for crockpot recipes. As soon as I saw the rust colored stoneware, my eyes lit up. I was imagining returning home after an exhausting hike, chilly and damp, to find the cottage warm and inviting with dinner already prepared. 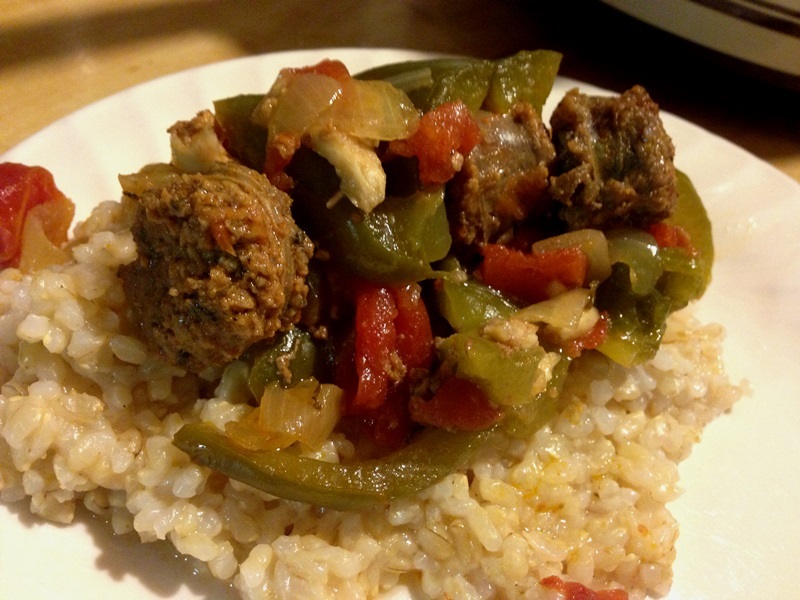 The unpredictable weather and our lack of planning foiled my plans to dine a la crockpot every night, though I did manage a hearty stew of sausage and peppers. Packed with local peppers, onions and a sausage filled with parsley, sage, rosemary and thyme, courtesy of the Keene Farmer’s Market, of course. Heat olive oil in a medium sauté pan. Add garlic and cook until becomes fragrant, about 1 minute. Add onions and sauté until slightly translucent, about 5 more minutes. Add peppers and cook until slightly softened. Transfer veggies to slow cooker. In same pan (add a little extra oil if necessary) brown the sausage until barely any pink remains. 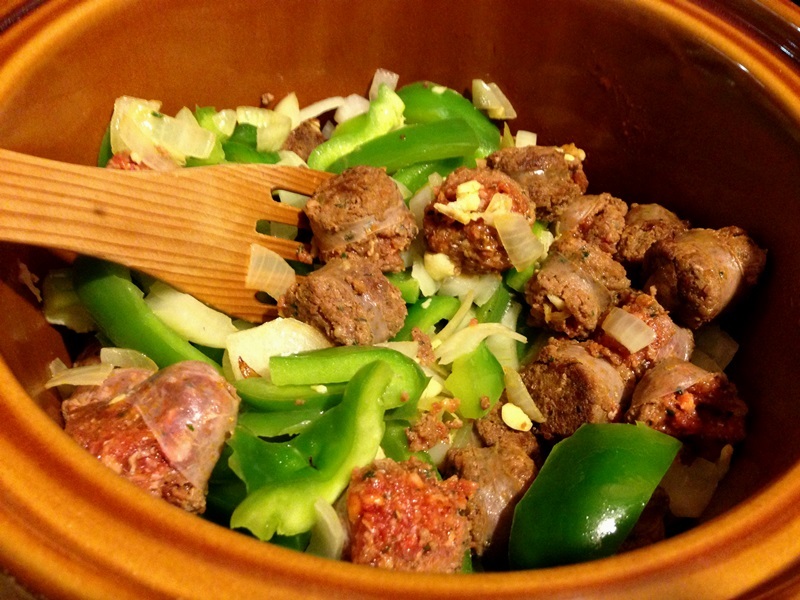 Add sausage to veggies in crockpot. Add Pour in chopped tomatoes and wine and mix well. Cover and cook on low for 8-10 hours. Serve over rice. The stew was nice and warming considering the weather was generally in the 40s or 50s at night. I actually would prefer a horrible kitchen that I could just gut (assuming the price is right). Galley kitchens aren’t the end of the world, it’s a matter of simple fixes like having one side with deeper cabinets. Kitchens that put a fridge opposite a stove where you can barely open either just don’t make sense to me. Thanks Laura. We’re spoiled right now with a pretty awesome kitchen. It’s eat in, though I wouldn’t mind giving up that feature because we never use it. NY kitchens are generally pretty awful because so many people just eat out and don’t cook. There’s the old wives tale that an oven is really storage for your winter sweaters. It’s amazing how often it seems true. 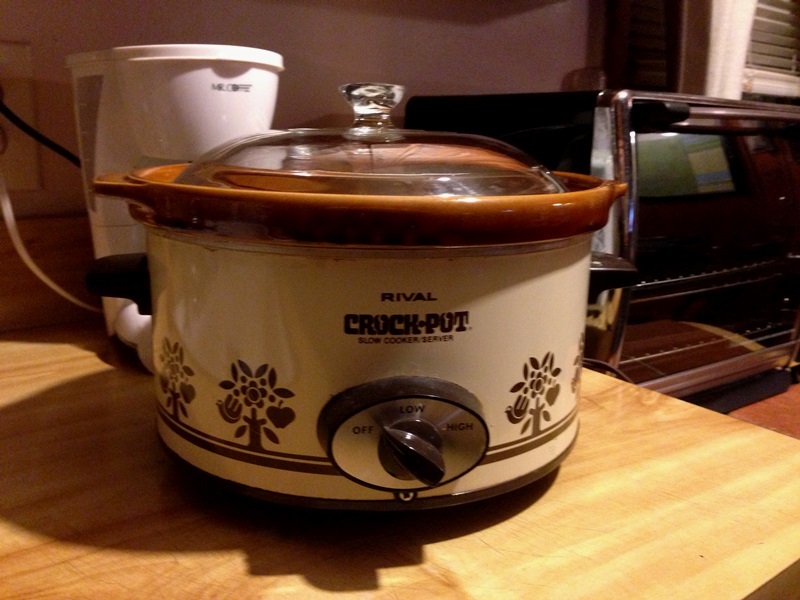 LOVE this, you are giving me crockpot envy!! Sausage and peppers were meant to be together. Haha, if I still had my old crockpot you probably would have found it with a ribbon on your doorstep by now. You really need to get one! Not only does it make the cooking easy but the house will smell fantastic! That is the one hard thing about going on vacation. You are so use to everything you have at home it can be difficult to know what to pack. Glad everything turned out okay.